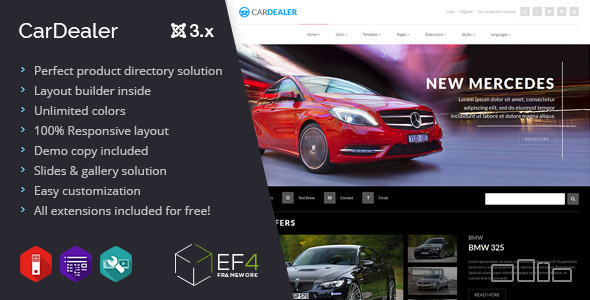 Car Joomla template brings the excellent solution for car dealers or other companies that work in a similar way. Let me explain the idea. The demo site presents the site of the company that sells used cars (new ones are also acceptable :) ). The company consists of 3 selling agencies (dealers) located in 3 different cities (you can create 1 or more sellers). The site gives the possibility to create an account for an employee of dealer agency to let them enter car offers that come to the company. This way all offers from each agency are placed in the same database and clients can see all of them or filter cars by the separate agency.